There is something about comfort food isn’t there? It seems to warm you from the inside out. It takes the chill out of a cold rainy day or the sting off of a bad day. Experts say we shouldn’t eat our feelings and I definitely agree, but there is nothing wrong with gathering around the table and enjoying a meal. Or chatting with a good friend over a cup of coffee…and a slice of pie. 🙂 It is a basic human right to connect with others. When my babies were well…babies…I could instantly soothe them by nursing them. It wasn’t the milk that comforted them…it was the closeness between us. I think that is the connection we have with comfort food. Give a child a warm cookie and a glass of milk and sit there…see what happens. Heck, give Big Daddy a warm cookie and a glass of milk and sit there…he will be more than happy to talk while the cookies keep coming. Same thing with this potpie. I know I call a lot of the food I post about “magical” and maybe in a way I believe it is. Sometimes for me, the difference between a good day and a bad day is knowing I am cooking something good for my family for supper. I can’t control how they do on their test, if they had someone to play with on the playground or if Big Daddy had a good day at the office…but a good meal? THAT I can do. I am a big believer in do what you can, where you are, with what you have. I guess maybe cooking is that way for me. I cannot control many things, but I can control whether or not my family has something yummy to eat for supper. And by sharing that with you, I guess I am in a way trying to help you out a little too. This world can be overwhelming, heartbreaking, scary, and many other things sometimes…the simple things will always be the things we come back to time and time again no matter how many fancy technological gadgets we have. Sitting around the table sharing a meal is time tested. We know that works. Which brings me to this wonderful chicken pot pie recipe I have for you today. Chicken potpie is one of my favorite dishes. When I was little, I loved the Swanson potpies and as I got older I would order it at restaurants. I finally found a recipe that fulfills my potpie desires AND now I can have potpie any time I want. Well, anytime I want to cook one. 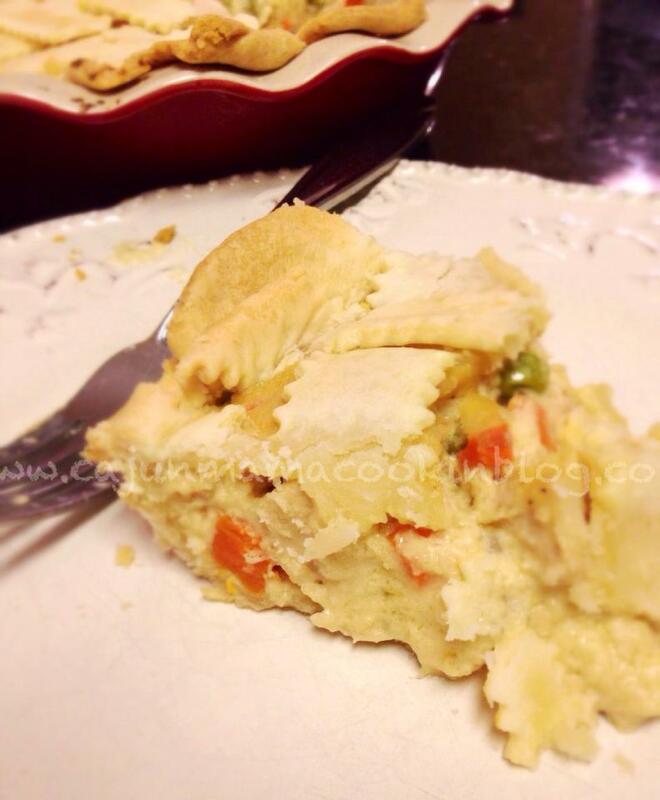 Bonus, one of my little girls love chicken potpie as much as her mama and she loves this recipe. Oddly enough, this is the very first Paula Deen recipe I saw her make on her show when my friend Kylie introduced me to Paula Deen back in 2004 and i was pregnant with that same little girl. I craved chicken potpie during that pregnancy and needed to find a way to get some. Funny how that works. Plus, this recipe makes two potpies if you want it to or you can freeze extra filling. This potpie recipe makes enough for two potpies, so you can either make both and take one to a friend who could use a good meal or simply freeze the extra filling in some Tupperware for another time. I adapted this recipe from Paula Deen’s Lady and Sons chicken potpie recipe. I added potatoes and more carrots and peas. Other than that, this recipe is just absolutely delicious and perfect. Now, I followed the original recipe instructions for the dough, but I will tell you an easier and in my opinion, better way, to do the crust. The original called for puff pastry dough, but here I will tell you how to use a basic roll out pie crust. Preheat oven to 350 degrees F. Roll out one Pillsbury or store brand pie crust. Lay it in a 9 ” pie plate. (If you are prepping 2 potpies, then do the same for another pie crust). Bake your crust(s) in your preheated oven until it is lightly browned. About 8 minutes. This ensures that your potpie is evenly cooked throughout. Leave your oven on 350 degrees after you take the crust out and set aside. You can use canned pea, carrots and potatoes. I throw the frozen peas, cut up fresh carrots and potatoes into a pot with the veggies just covered with water. I bring them to a boil and then reduce heat and simmer until the carrots and potatoes are just tender enough. Usually about 15 minutes. I get this going before I start cooking the chicken and the process moves along nicely. Drain the veggies in a colander when they are tender. Set aside. In a large saucepan, melt butter and then slowly whisk in flour, stirring until it is the consistency of peanut butter. Do not brown it and stir it constantly for about 2 minutes or so. Slowly whisk in the cream and continue to stir. Add chicken base, garlic and onion and stir until thickened. Add the cooked peas, carrots, and potatoes and nutmeg, if using. Add your cooked chicken. Give it a good stir to combine and then remove from heat. Pour the filling into the pie crusts (s). If you are only making one potpie, Pour until the filling almost reaches the top of the pie crust. About an inch under. Top with other pie crust and then bake in the oven until the top crust is nicely browned. About 20 minutes. Let it cool and then serve. You are in your happy place. Comfort food nirvana. Enjoy!!! Previous Postchicken piccata stuffed mushroomsNext PostNew cover photo!! !